The title should be Sunday Silliness! I don’t know how I lost the S. I’m not ill. Stupid WordPress. It’s Sunday, which means its one day away from Monday. I have been locked in my craft room, so I really don’t have anything fun, interesting or newsy to report. I thought instead of a post of rambling, I would share some fun card ideas I have made over the past few days. Not sure if I will turn them into cards for the shop or not, but they amuse me. Click on the cards if you want to make them bigger. 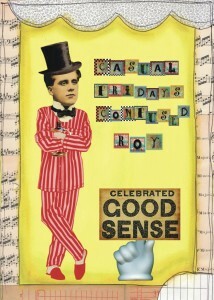 The card reads: “Casual Fridays Confused Roy” I had the image of the pajamas and wanted to do something fun with it. I added a booze bottle to his arms, just for fun. He doesn’t know if he should dress up or down. 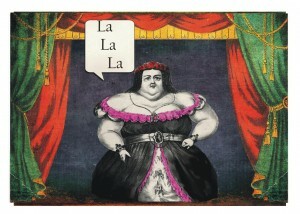 It’s not over until the fat lady sings. Look at her sing. This is the first time I tried to color something all by myself. I did the pink on her dress. There were people in the picture with her and I cut them out as well. Go me! If any of you have some fun ideas for cards or some fun saying to make into a card, I’d love to hear them. Yesterday, my friend Julie, gave me the “Sunshine Award” Her blog is Tri-ing to be Athletic and it’s a hoot. All her posts are done in stick figures. Check out the award page here, its a hoot! I’m supposed to pass it along to other bloggers. However, I have not been a good bloggy buddy. I have not read many blogs as of late. So I will just say, Thank You! Now go look at her funny drawings. Its a bunch of things about her in stick figures!! Gosh Bernie, your cards are just getting better and better. I can imagine so many situations that they would fit perfectly. Keep it up!! Thank you. Its getting easier to make cards that are more fun. Ohhh love the card with Stella, sometimes I need to change my perspective as well, it dosen't work for me either. Wonder why that is?!? No a clue. I feel as if I should change mine as well, but it doesn\’t work. You forgot to mention I have stick figures Again, you're welcome. You're definitely a positive person. No need to pass on the award; I just wanted you to have it. I especially love that first card…too funny! Thank you. Its taken me a long time to get this far. I feel as if I have been learning a lot. Thank you. I had to try it several times with different brushes and paint buckets and stuff. I didn\’t know what in the heck I was doing. Those are fun! I love the changing the outlook one! I have to go lock myself in craft central today, but more to pick up the disaster it has become since it is also the guest room, and guests are coming in five days! Eeek! Oh, ugg!! Nothing worse than having to clean for guests. Its nice when they are with you, but the stress of getting ready. Good luck with getting it picked up. I don\’t envy you at all.